"The Age of the Bones" was a period lasting about fifteen years during which the sound of forbidden Russian and Western music was completely associated with images of the human skeleton. It was a period of what might be called "roentgenizdat" - the audio equivalent of the "samidzat" private publication of banned written works. In the Soviet states during the pre-glasnost era, many modern Western bands were banned for all sorts of reasons including 'neo-fascism', 'mysticism' and even 'obscurantism'. Much Russian music was also banned for a variety of other reasons. But a vibrant, secret and risky trade grew up in what became known as'Bones'or 'Ribs'. 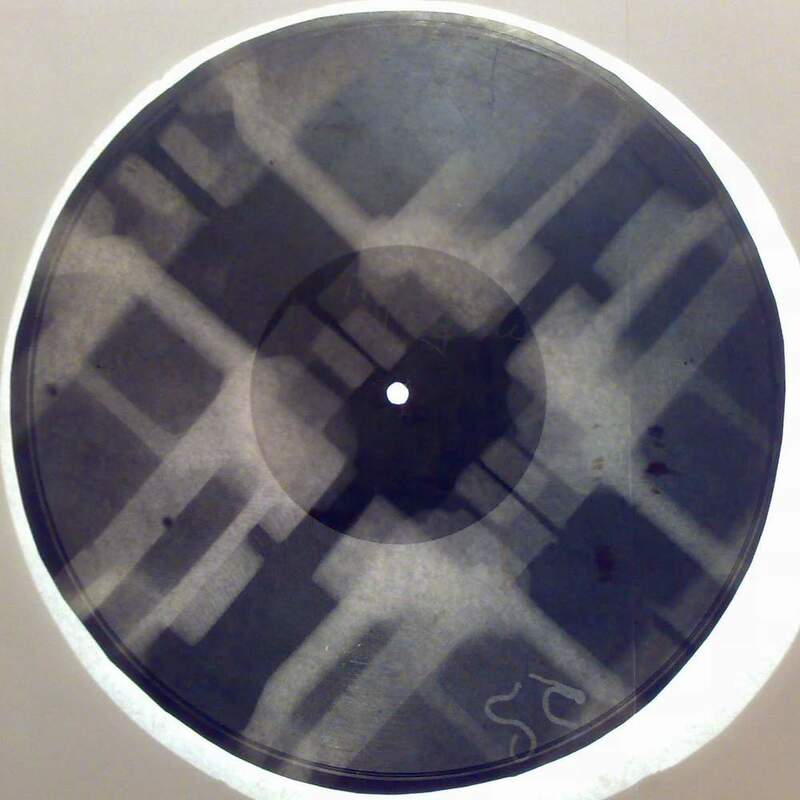 These were medical X-Ray fluorography sheets illegally obtained from hospitals, cut into discs and embossed with the grooves of bootlegged gramophone records - a kind of medical version of a DJ dub plate. The quality was poor and the discs wore out quickly but the cost was low, just a couple of roubles compared with the fabulous cost of an actual Western LP. There are many stories to be researched about the people who made these recordings and how or why they did it. Some of them not only bootlegged the discs themselves but also copied the machines that made them in order that the process spread and persisted. They were often people who were fired up with a passion to share music, who risked and sometimes lost their liberty at a time when not only the private copying of music was an offence, but even listening to certain songs could land you in gaol. Despite the inevitable imprisonments and clamp downs, the culture of the Bones persisted right up to the mid-sixtes when reel-to-reel tape recorders became common enough for this laborious real time process to no longer be necessary. In our time and culture, when a song can be copied and shared with a mouse click, when the mass pirating of music is almost acceptable and when almost nothing is forbidden, it is fascinating and salutary to contemplate an era long before Spotify, before mp3s, before cds and before tapes, when much music was only available "on the bone". The X Ray Audio Project will feature in this Autumn's BBC 4 series 'The Echo Chamber' prior to a full radio documentary. The X Ray Audio Project has received ARTS COUNCIL ENGLAND funding. A selection of the authors' X-ray recordings are currently showing at London's contemporary Russian GRAD GALLERY in the "Work-and-play-behind-the-iron-curtain" exhibition. With further events to follow. Many older people in Russia remember seeing and hearing strange vinyl type discs when they were young. The discs had partial images of skeletons on them and were called 'Bones' or 'Ribs'. In an era when the recording industry was ruthlessly controlled by the State, an alternative source of raw materials was found to make illegal recordings - used X Ray plates obtained by bribery from local hospitals. For more on the story of the X-Ray recordings go here. Writing and producing a high quality book with STRANGE ATTRACTOR PRESS for publication in 2015. The book will contain photographic images, essays and a selection of audio examples of the range of forbidden content the discs contained. Interviewing and recording surviving Russians involved in the creation and distribution of the recordings. Photographing and collecting a selection of high quality, examples of the discs for posterity. Engaging with academics and experts in the field to uncover and understand the various technical and cultural aspects relating to the use of the X Ray plates. The production of a short film documenting the process of creating a new 'Bone' with a specially commissioned piece of music and contemporary x-ray plates. Creation of a website devoted to the publication and a collection of images of the X Ray recording. In "GRAD gallery", "bone", "bootleg", "paul heartfield", "rib", "soviet music", "stephen coates", "x-ray"